Think ebooks are dead? Not even close! It's still HUGE and I'll show you exactly how to... "Rake In Real Cash 24/7 With Your Own Ebook Business In A Week From Now - It's Like Having Your Own Private Money Machine!" It doesn't matter if you're brand new to the Internet, or don't want to work hard, or you can't write anything...you can make a killing fast with this simple, proven system...and build a successful business that lets you retire to your beach house! Do you know why some people (even if they're new to the Internet) make piles of money without lifting a finger, and leave their day jobs behind? It's because they have a secret. It's not a secret most people are willing to talk about, because it seems like it takes a little more work than the "easy" ways to make money online. But that's a myth! This secret tactic successful online business people use is downright easy once somebody shows you how to do it. Let me tell you something that I'm probably uniquely positioned to claim... Promoting Other People's Products Can Make You Rich, But It's Only The Tip Of The Iceberg! One of the fastest, easiest ways to make money on the Internet is to promote other people's products... And I've actually got a bit of reputation as being one of the best at promoting other people's products and share the profits. BIG profits. But Here's The Thing... There's even more money out there that most product promoters never get to touch. They're settling for a LOT less than they could be making. That's because they think promoting other people's products is the only easy way to get started on the Internet. They couldn't be more wrong. Back to that "secret" I mentioned before... The People Who Make The MOST Money... All Have Their Own Products! Okay, so now you know. Want to make a killing online? Want to give yourself the calm peace of mind that comes from knowing you'll bring in $5,000 next month...or whatever number means "success" to you? Want to tell your boss to take a hike? Then you need your own product. Period. Think about this... Suppose you're promoting somebody else's product, but that person decides not to sell it anymore. What happens to your income? That's right, it plunges off a cliff. You ultimately have zero control over your income when you don't own what you're selling. Having your own product gives you a "money machine" you control that gives you a solid, reliable income day in and day out, month in and month out. Best of all, that income stream comes from work you do once. Then you just sit back and collect the cash. Even better, having your own product means you're building a real business that will let you turn your back on your job and retire to the life you really want to live. But here's the mistake most people make... The Only Way Making Your Own Product Is Hard Is If Nobody Shows You How! Most people who try to get started online hear everybody screaming about how affiliate marketing (promoting other people's product for a profit) is the easiest place to start. Why? Because most people screaming that advice say... "You don't need a website!" "You don't need your own product!" Both things are true. But here's what they don't tell you... You can make good money without your own product or website, but if you have both, you can make money that'll make most rich people feel like they're poor. So why don't more people do it? Because they're scared of it. Most people assume getting your own product and website is hard to do, and they're flat-out, no-joke dead wrong...if somebody shows you the easy way to get both done. Then you'll have your own personal money machine that doesn't make you dependent on somebody else's product for your income. 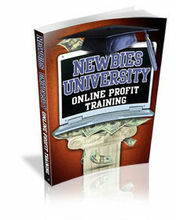 And I'm going to show you how to fire up your very own profit engine like that within a week from now... Introducing "Ebook Money Machine" - "The Complete Blueprint For Creating Your Own Ebooks Quickly And Easily...And Making Money With Them Fast!" 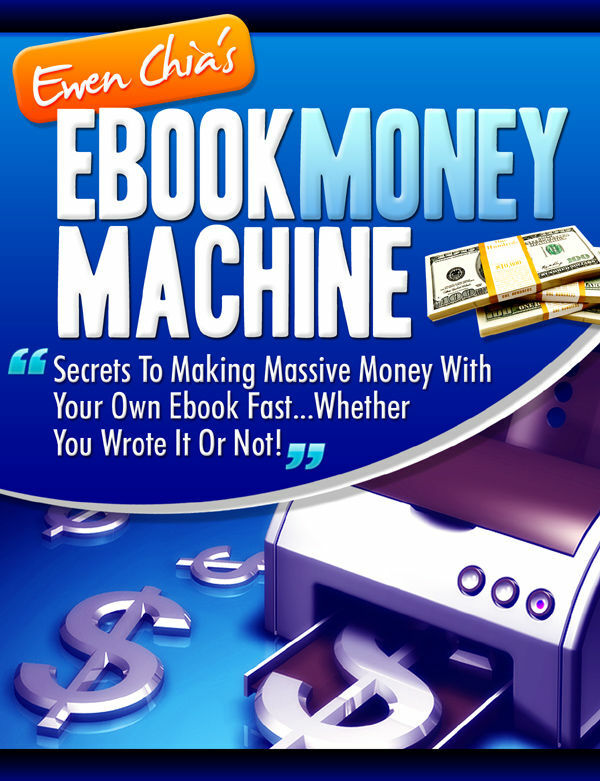 I created "Ebook Money Machine" with one goal in mind... To show literally anybody with just a little gumption how to create and market and ebooks in a week or less! This one easy-to-follow blueprint is all you need to do just that. It covers everything you need to know, from finding a market full of people ravenously hungry for the information you'll give them to selling it like there's no tomorrow. Here's a taste of the table of contents to show you what I mean... There's absolutely no fluff, just meaty real-life, "in-the-trenches" techniques that get results! That's the kind of detail you can expect. There aren't any "missing pieces". There aren't any dots left for you to connect. I won't leave you hanging, wondering what to do next. No, I'll take you by the hand and walk you through each step as you learn stuff like... The right mindset for writing an ebook. If you don't have this, your ebook will crash and burn. You have to know how to make the all-important ebook writing decision...which I reveal inside. How to mine your subconscious for the ebooks already in there. Yep, your head is already full of ebooks, and I'll show you exactly how to tease them out of your brain into ebook form so you can profit from them. This technique is so powerful, you'll be miles ahead of other people trying and failing to sell crummy ebooks. 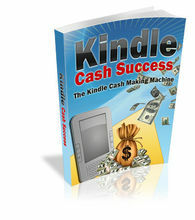 One simple secret to creating an ebook that sells like gangbusters. It's as easy as one four-letter word (no, not one that would make your mother blush). And I'll give you a simple process for using it to turn on the jets for your ebook creation process. The right way to find a market niche that'll gobble up your ebook like they're starving to death. This is more than half the battle, and I'll give you a quick and easy way to find these gold mines without spending a single penny. All you need are the three free tools and the simple formula I'll hand you. A way to know your book will sell. This is like being able to buy Google stock before it took off. 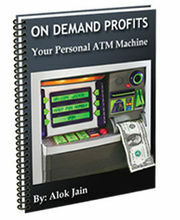 You can know beyond any serious doubt that your ebook is going to fly off the digital shelves. I'll show how to use two simple free tools to see what people want and are buying like their lives depend on it. And I'll even show you a cheap tool that lets you mine one of the largest sites online for what's hot. The easy way to write your own ebook. No, it's not hard...and you usually don't have to start from scratch. I'll hand you 13 easy ways to create a product that'll make your market (and other marketers) drool. And 12 of those methods are NOT starting from scratchâ€”some are so easy you might think they're criminal. How to get your ebook ready to sell. Don't think it's all about creating the thing. No way! You have to make sure it's ready for prime time, or you'll cut your marketing off at the knees. I'll show you how to "publish" your book, and even more important, how to tear it apart so you can make even more money with it. And speaking of making money... 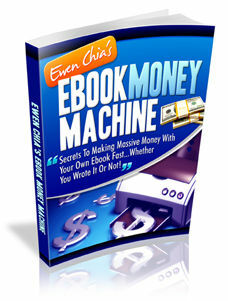 I'll show you the drop-dead easy way to set up your own website to sell your ebook like crazy. This single step scares most people off...but that's fine, because that means more money for you! 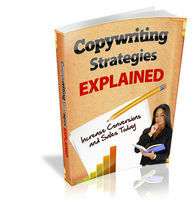 You also get seven website tips that are proven to increase your sales. Eight shockingly powerful ways to market your ebook. Two of these ways are so cutting edge that almost nobody is talking about them yet. You'll be far ahead of the curve. Even better, I'll show you how to combine these techniques to crush your competition and see the cash fast. Four simple strategies to balloon your ebook income. So you've not got an ebook. How about doubling or tripling your income from it...with barely any extra work? It's easy, and I'll show you excatly how to do it. (HINT: This is where affiliate marketing really DOES matter.) A Top Secret way to make HUGE money from an ebook that'll blow you away - and you don't even have to write a word! You haven't see easy until you've see this. 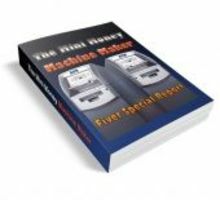 I'm talking about a plug-and-play solution that lets you apply everything from Ebook Money Machine within 48 hours...yes, even faster than a week. The easy way to write your own ebook. No, it's not hard...and you usually don't have to start from scratch. I'll hand you 13 easy ways to create a product that'll make your market (and other marketers) drool. And 12 of those methods are NOT starting from scratchâ€”some are so easy you might think they're criminal. Check your spam folder, because the product was sent to you the same day you place the order.